Carcharodon megalodon was an ancient sea shark that we know today only through the fossilized teeth they left behind. Because the supporting structure of sharks is soft cartilage instead of bones, there is literally nothing but teeth to fossilize. With so little to go on, there are many heated debates raging in the paleontology world. Is Megalodon Related to The Great White? One of the most contested issues is the classification of the giant creature. Basically, scientists want to know the relationship between the ancient shark and its modern-counterpart, the Great White Shark, Carcharodon charchias. Are they members of the same genus and family or are did they develop on completely different ancestral lines? To sort things out, scientists look to an extinct mackerel shark, Cretolamna appendiculata. Teeth from this species date as far back as the lower Cretaceous period and are found world-wide. There is agreement from both sides of the argument that this is a common ancestor for both Megalodon and the Great White. The next level of classification is where the argument begins. Proponents of the close ancestral relationship between Megalodon and the Great White believe the next ancestor was Carcharodon orientalis. This ancestor led to numerous groups of Carcharodon species eventually ending in a split: one that produced the Carcharodon megalodon and one that produced the Great White, Carcharodon carcharias. Scientists of this theory compare and find similarities between the teeth of Megalodon and the Great White. They site several similarities: in quality and number of the serrations, form (except for serration size and root depth), the structure of the teeth, and the patterns of tooth development as set in the jaw. Because of these similarities they believe the name should remain Carcharodon megalodon. Of course, the opposing viewpoint responds to each of these with a counter proposal. First, let’s take a look at the lineage proposed by this group of scientists. These scientists also begin the line with the Cretolamna appendiculata. That is where the similarity ends. 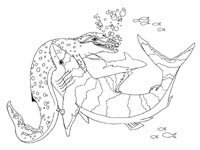 They think a split occurred after Cretolamna appendiculata into two divisions: Otodus obliquus and Paleocarcharodon orientalis. They believe that the Megalodon came down through the Otodus species, while the Great White came from an entirely different lineage. Therefore the name should be changed to Carcharocles Megalodon. Regarding the serrations on the teeth of the two species, this group of scientists observes that the serrations on the Great White teeth do not change in terms of quality or number as the shark ages. Further, they say the serrae if the Great White are much larger and irregular compared to those of the Megalodon. These scientists would argue that one can’t ignore the root depth and serration size. They also look at markings on the blade (all that is left if you ignore the other factors) and show distinct differences. They also disagree with the comparison of tooth structure, stating that the tooth structure of all the lamnoids (ie. cretolamna) is similar. In addition, these scientists compare the internal pores for nerve and blood vessels, and show a distinct difference between the two species. Vessels of the Great White are large and in groups. Megalodon’s are small and scattered. These details may seem insignificant for the layperson or even for the teacher or collector. However, a quick Google search for Megalodon will prove this is no insignificant matter at all. You will find those sites that ignore the controversy entirely, keeping with the older classification of Carcharodon megalodon (dating from 1873). Still others interchange the genus name, using “Carcharodon (Carcharocles) megalodon” as an adequate identification. There are a few who will mention the controversy, sending you to some pretty complicated scientific sites. Hopefully, as you follow your quest to identify your recent Megalodon find; this article will help make a little sense of the controversy.